Around our house, although February is a quick month, it’s one filled with love. The boys enjoy pulling out their Valentine’s Day books to read together. One of our favorite picture book characters has always been Cookie Mouse. 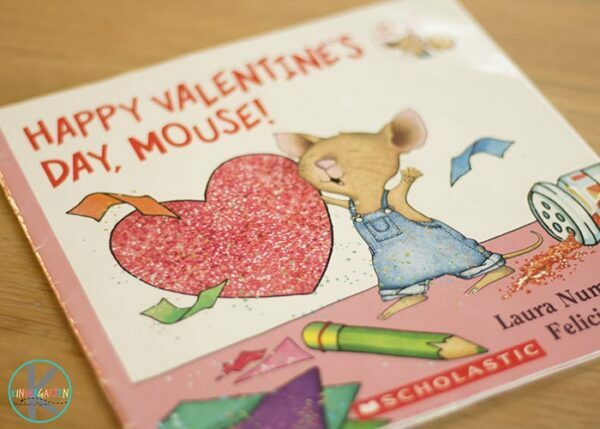 It’s no surprise each February when we re-read Happy Valentine’s Day, Mouse! often. 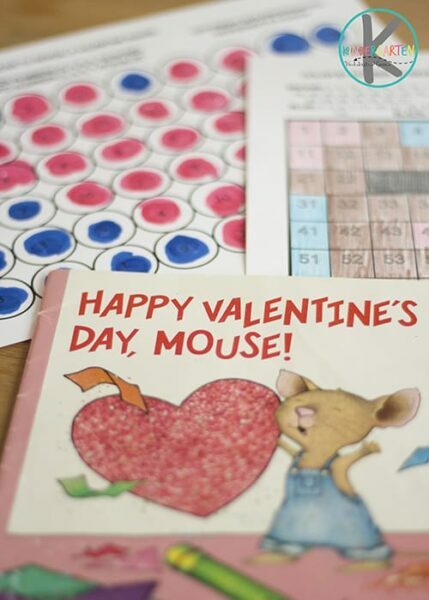 Grab these FREE Happy Valentine’s Day Mouse Worksheets for low-key learning this February. Read Happy Valentine’s Day, Mouse! Cookie Mouse is one of the best known characters in children’s literature. Laura Numeroff and Felicia Bond have created a sweet and silly character that kids love. Happy Valentine’s Day, Mouse! features Cookie Mouse, hard at work on Valentine’s Day cards for his animal friends. The illustrations are bright and engaging, without being too busy. Each animal has been drawn with personality shining through on their faces. The text is simple and straight forward, making the book a great choice for early readers. Happy Valentine’s Day, Mouse! 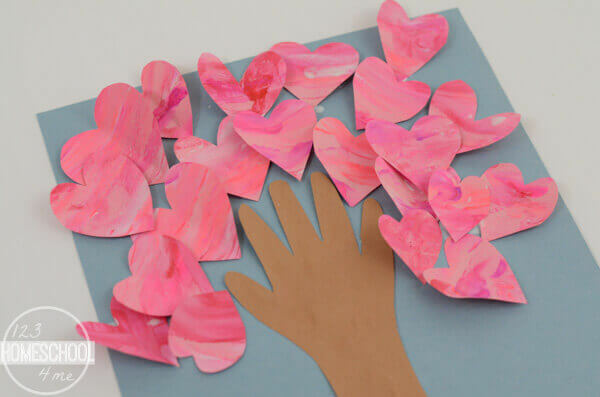 is a perfect choice to introduce a discussion on friendship as kindness, as we watch Cookie Mouse create a Valentine based specifically on what he loves about each friend. Inspired by the sweet illustrations in Happy Valentine’s Day, Mouse! I created two low-prep printables perfect for quiet time or independent work. 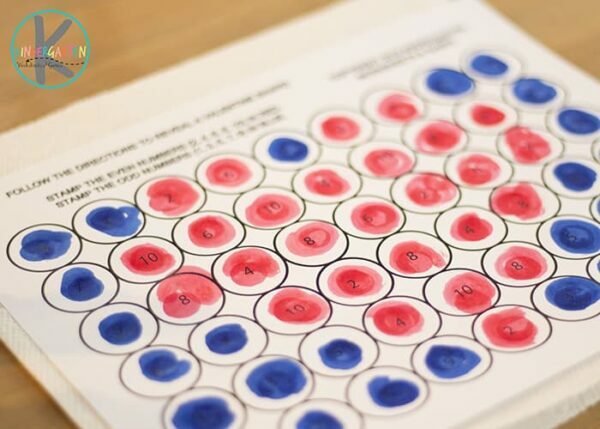 Both focus on basic math knowledge, giving kids a chance to pair math work with art. Free Valentine’s Day printable pages. A color by number 100 chart. A do-a-dot page with even/odd practice. Brown, pink, blue, and black are needed. Red and blue are required. You can always substitute markers, crayons, colored pencils, etc. if you don’t have daubers on hand. Assemble all necessary materials to complete the printable pages. Encourage kids to read and follow the directions on each activity. 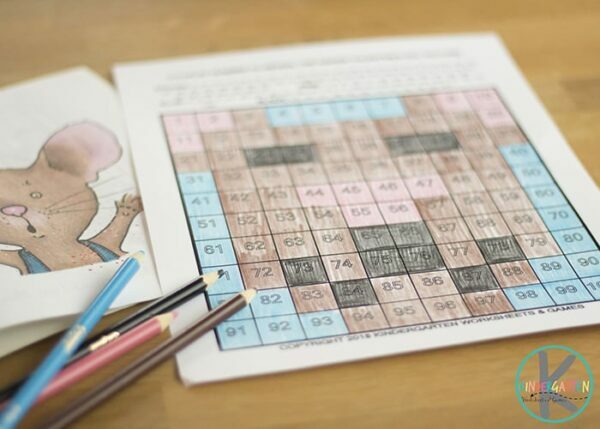 100 Chart: Color by number according to the list at the top, focusing on correctly identifying each number 1-100. When the chart is finished, kids will love seeing a picture of Cookie Mouse’s face! Stamp Page: Stamp according to the instructions at the top, focusing on identifying which numbers are even and which are odd. When complete, a simple Valentine shape will be revealed. 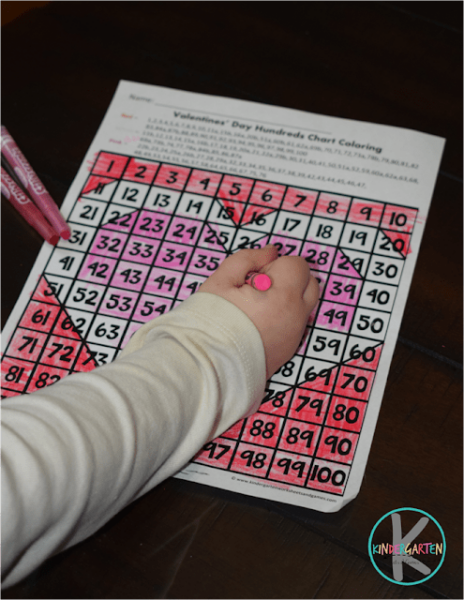 Kids will have fun practicing identifying numbers with these FREE Valentines Day Color by Number.